In today's business world, it takes more than a website to stay competitive. The smartest, most successful companies are using radically new membership models, subscription-based formats, and freemium pricing structures to grow their customer base--and explode their market valuation--in the most disruptive shift in business since the Industrial Revolution. Whether you're a small business with limited resources, an established company using a traditional business model, or a hungry start-up who wants a bigger bang for your buck, this comprehensive guide provides a wealth of membership-building options to suit every need. You'll learn the best-kept secrets of top industry leaders, from global giants like Am Ex and Weight Watchers to smaller dot-com successes like SurveyMonkey and Pandora. You'll find proven strategies for creating membership programs for everything from vacation timeshares and car rentals to video streaming and Software-as-a-Service. 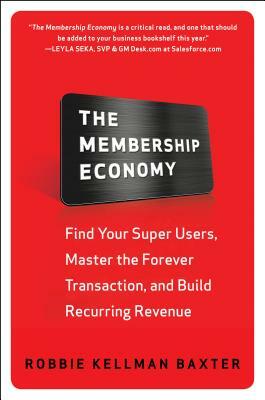 Most importantly, you'll discover what works, and what doesn't, from some of the key players in the new membership economy. It's not about ownership; it's about access, options, and freedom. When you join forces with your customers, membership has its rewards--for you, your company, and your continued success. Robbie Kellman Baxter is a consultant and speaker who has been providing strategic business advice to Silicon Valley companies for over 20 years. She is the founder of the consulting firm Peninsula Strategies LLC, and regularly presents to professional associations, leading universities, and corporations.